We both had a rather restless night so we had a very leisurely morning. 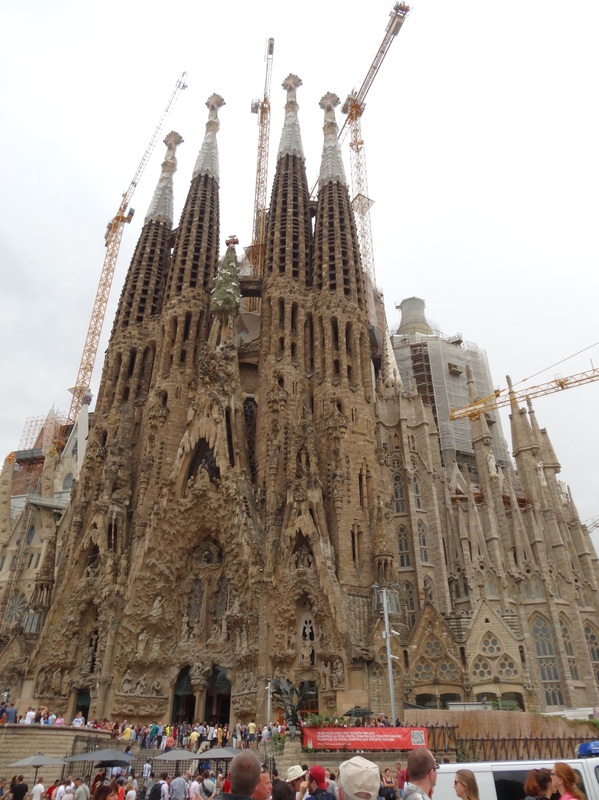 I had an early afternoon nap and Bob went exploring, then we went to check out the Sagrada Familia which is only a short walk from our apartment. This is our first view of this incredible cathedral, which is Gaudi’s greatest work. This is the Passion Facade, which was completed from 1986 to 2000, by the artist Josep Maria Subirachs. It is very different from the Nativity Facade which was completed in 1930, four years after Gaudi’s death at the age of 74. He was run over by a tram while crossing the street near the church to which he devoted forty years of his life. We walk around to the other side of the cathedral and stop to watch these little green parrots which nest in the palm trees in the park. They make an incredible amount of noise! 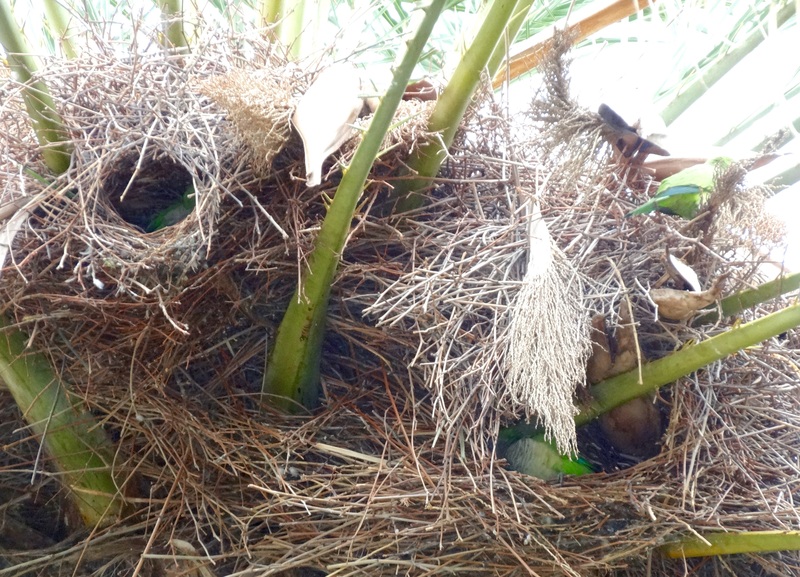 They were difficult to photograph, hiding in their nests and under the palm fronds. 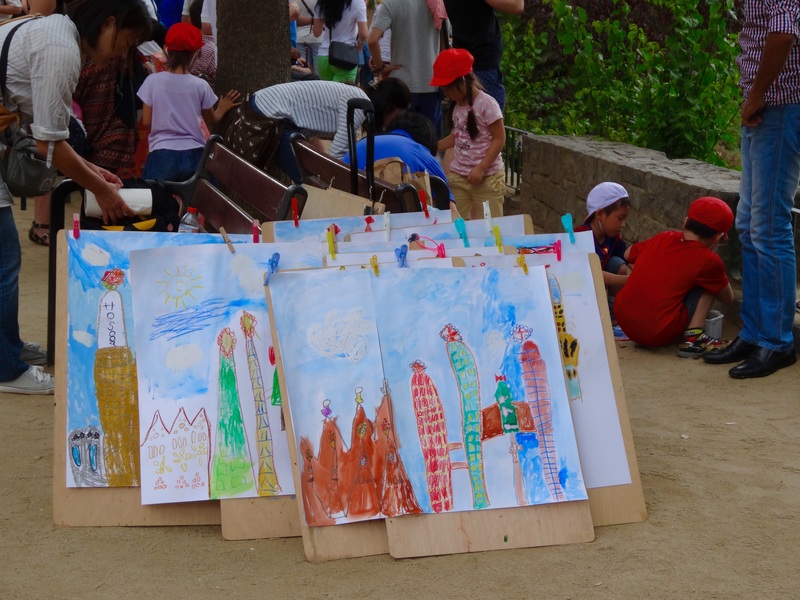 There was a group of young children in the park making wonderful paintings of the cathedral. Here is the other side of the Sagrada Familia, the Passion Facade. I am looking forward to spending more time here and visiting the inside of this amazing cathedral. Too tired today for more than a brief visit. We head back to our apartment for dinner and afterwards go for another walk, looking for an English bookstore to buy a guide book for Spain. On the way there I discover a fabulous looking art supply store just a couple of blocks from our apartment. I definitely need to check it out. 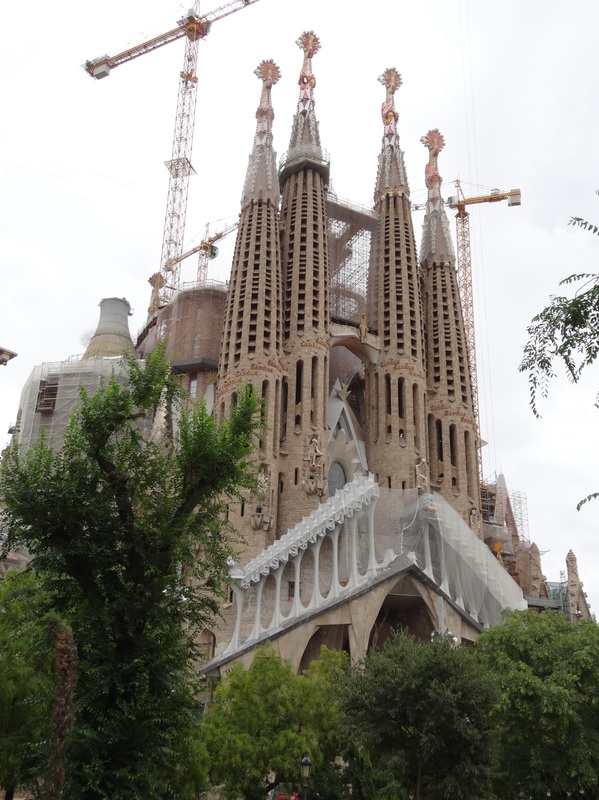 This entry was posted in Barcelona, Cathedrals, Historic Buildings and tagged Art stores, Churches, Gaudi, Sagrada Familia by Trudy. Bookmark the permalink. I always enjoy visiting art stores in new cities. This one looked quite large. Hopefully I will get to check it out today or tomorrow. We may wait until we return to Barcelona in December to visit the the Cathedral because the weather is beautiful and we think we should spend our time outside right now. Best mail that came my way all day aside from the photos of Maddy and Lincoln! I will have some nice dreams now and pretend I am traveling with you. Thanks Gayle, glad you are enjoying the blog.